to make the rolls : mix the flour,milk and salt in a vessel. now using little water knead a soft dough. the dough should neither be too stiff nor too soft.keep it aside for 15 mins. knead the dough and divide it into equal parts and roll out thin rotis. heat tawa and cook the rotis (ready 3/4 cook) on both sides. keep aside. don't cook the roti completely otherwise while assembling the wrap they will get very crisp and dry. to make the stuffing: mix all the ingredients of marinate well and then add paneer cubes. let the paneer marinate for 15-20 minutes. heat oil in a pan and fry capsicums for 2-3 minutes. now add marinated paneer and saute for 5-6 minutes on medium flame stirring occasionally. now add tomatoes and saute for another minute. to make a roll: take a roti and spread some green chutney in the center, then put the paneer-capsicum-tomato stuffing evenly in the center. sprinkle thinly sliced onion and some chat masala. now fold /14 of the roti horizontally from the lower side and then roll the roti vertically tightly ensuring that no stuffing falls out. how to serve: heat the roll on the tawa. then wrap each roll in a aluminium foil and then cut diagonally from the center into two pieces. arrange on a platter and serve with tomato and green chutney. 1. you can use whole wheat flour (atta) to make healthy wraps. 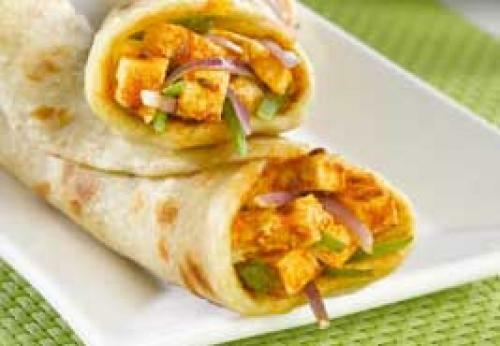 2. you can use non stick to cook the paneer and avoid oil. 3. you can use low fat yougurt for the marination.